At the Beijing International Auto Show, Jeep introduced its four concepts. While each of them was unique and a lap ahead in their respective genre, Jeep Wrangler Sundancer Concept 2014 took the entire gleam from our side. With its robust power the Wrangler this time carries sophisticated looks that were well complimented with the sense of fashion the entire concept was undoubtedly iconic Let us have a look at the review of Jeep Wrangler Sundancer Concept 2014 to know about its details. 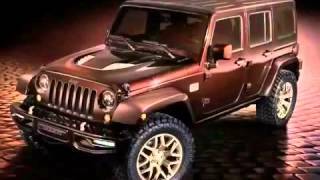 Looking at the exterior of Jeep Wrangler Sundancer Concept 2014 from little distance you could notice the tri-coat Chocolate Brown metallic color covering it with gold accents amalgamating the additional gleam required while the LED lighting over the bumpers received golden bronze accents. 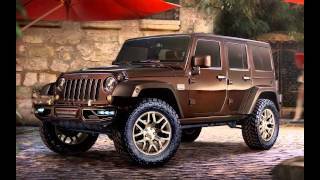 The outer body of Jeep Wrangler Sundancer Concept 2014 gets some remarkable new colors with matching accents, the first sight of which will make you believe that this isn’t your regular Wrangler. Adding to the aggression of this gorgeous model, company has fitted 20-inch Pale Gold Billet aluminum wheels with polished gold inserts. As we mentioned earlier, that the Jeep Wrangler Sundancer Concept 2014 is not just about sport and aggression but it’s a sophisticated piece of work company is introducing in Chinese market. Live example to this can be noticed in the interior of Jeep Wrangler Sundancer Concept 2014, which comes highlighted by Axis II perforated seat inserts and highly exclusive Berry Baltique Semi-Aniline leather. Moving ahead you can also find door panels and upper part of instrument panel being wrapped in leather, which is indeed premium and exclusively for this part again. The essence of this gets enlightening when with the contrast stitching. 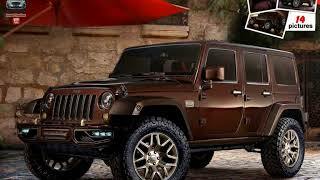 Especially for the Jeep Wrangler Sundancer Concept 2014, company has used ‘Gold Rush’ paint over various parts like handle of doors panels, passenger side dashboard, steering wheel bezel, gear knob etc. There isn’t any declaration from the company regarding total output of JEEP WRANGLER SUNDANCER CONCEPT 2014 or the top speed of JEEP WRANGLER SUNDANCER CONCEPT 2014 and other performance figures but expecting a 3.6 Liter V6 or a 3.0 Liter V6 won’t be a mistake. However without giving any final verdict we would prefer waiting for the company’s poll.